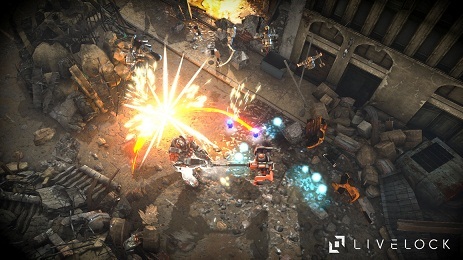 With Livelock, the Perfect World Entertainment and developer Tuque Games bring a topdown shooter for PC, Xbox One and PlayStation 4. This is not only the first game developed by Tuque game, but also the first in Perfect World that is known far more as a publisher for Free2Play MMORPGs, including Neverwinter, Star Trek Online and PWI. The game is not overly complex but some questions may arise for example: Which skills my class really need? And which weapon is better? That is why we have compiled some useful tips to help make your adventure in Livelock a bit smoother. - New weapons and abilities you will receive automatically. All you need is to complete a level, then your character will be credited with experience points and level up. - The new weapons and talents are unlocked until character level 11. Then follow up to the maximum level 30 for different upgrades, which can be selected in the character menu (called "Lobby") for each fight talents. Pro Talent - there are two possible upgrades. - In addition to weapons, talents and upgrade your hero also gets to some level ascents lasting passive bonuses. However, they will not be displayed in the lobby view. Instead, added to the main menu and choose "progress" - there you get a complete overview of all character progress. - You have already played Livelock and want to level up fast in a class? The final boss is the fastest way to gain a lot of XP - defeated him to get some experience points easily. - Explore the levels! Away from the main path you will find many blue glowing robot body and boxes from which you can collect materials to upgrade your weapons. Every now and then you can also destroy walls, which gives you access into hidden areas. - Usually it is advisable to return to the Mission initially into the lobby to select new upgrades and especially upgrading the weapons. In multiplayer mode, on the other hand starts the next mission directly. - Annoyed with the weapons menu of value "cadence"? Quite simply, the term stands for the speed, with the fires your weapon. - From time to time three types of boosters appear in levels that look like pyramids. They give you and your group briefly enormous advantages, so use those things! Yellow pyramids stand for "Ballistic overclocking" and give a bonus to melee damage and invulnerability - they are perfect for Vanguards. Violate pyramids provide "Electric overclocking" and improve your shot speed, and your chance to critically hit - ideal for Hex and Catalyst! Blue Pyramids give the effect "Electric transmission" and increase the movement speed, they also shorten the recharge time for your skills. Hex is the strongest class in the game, and shares the greatest amount of damage. But his armor is quite low, which makes Hex vulnerable. What is the main weapon to use, is more a matter of personal taste, but we had the impression that the plasma gun is more effective in conjunction with other factors (electric overclocking, armor). As secondary weapon we have chosen the Oathkeeper as it is greater harm havoc on high expansion levels than the plasma gun - it is less against moving targets, but it is well suited to large damage against bosses and enemies. We have selected the Hellfire missile launcher as heavy weapon. It is unerringly even in the most hectic and directed together with armor of devastating damage - probably the most powerful weapon in the game. At the beginning of the cluster mines you’ll find a good companion that provides severe damage and keep Hex opponents at bay. Later we have replaced it. Armor is the most important skill of Hex because it multiplies the damage of all weapons! Especially practical: Armor Hex effort not only by several enemies throughout, but also ignores enemy shields. Even against bosses very effective! When upgrading we advice to the corrosion effect. However, Hyper-speed is not recommended. Practical is to active camouflage, because once Hex makes invisible that gives valuable seconds, to heal or reload a weapon. But beware: even invisible Hex is still vulnerable! Armor (level 4): Provides briefly for improved cadence, projectiles can pierce through enemies and most shields. Upgrades: corrosion effect (weakens enemy armor) or better crit chance. Orbital Strike (level 10): Creates a strong Beam for few meters in front of the character. Upgrades: damage over time effect or larger effective radius. This guide only covers the Hex class, what about the other 2?